Does their abysmal grasp of energy and economics make Hillary and Bernie unfit to govern? “If I thought there was any evidence that drilling could save people money, I would consider it. But it won’t,” President Obama said in 2008. “We can’t drill our way out of the problem” of high energy prices and disappearing supplies, he still insisted two years later. How shocked he must be now. Horizontal drilling and hydraulic fracturing - aka - fracking [ has unleashed a gusher of oil and natural gas, sent oil prices plunging $100 a barrel since 2008, dropped US oil imports to their lowest level in 45 years, and saved American families tens of billions of dollars annually in lower energy costs. But if price and “peak oil” rationales fail, there is always “dangerous manmade global warming” to justify carbon-based energy and fracking bans, and renewable energy mandates and subsidies. Mrs. Clinton opposes all fossil fuel energy extraction on federal lands. She rejects fracking if “any locality or state is against it,” any methane is released or water contaminated, or companies don’t reveal “exactly what chemicals they are using.” Under her watch, there won’t be “many places in America where fracking will continue.” She will “stop fossil fuels” and ensure 50% renewable energy by 2030. One also senses that as president the two Democrat candidates will continue Mr. Obama’s imperial practices. If Congress resists their policy initiatives, they will simply issue more Executive Branch diktats, and ignore their impacts on jobs and the economy, the absence of evidence that fracking harms human health or water quality, the reality that renewable energy “alternatives” also cause serious problems and scientists’ continuing inability to separate human from natural influences on climate and weather events and trends that are essentially the same as during the twentieth century. Officially, 7.8 million Americans are still unemployed. But add the long-term unemployed, those who looked for a job once in the past year but not in recent weeks, and those who are working involuntarily in low-pay, part-time positions - and the total swells to 16.8 million. Over 46 million are on food stamps. The federal debt hit $19 trillion in February and is projected to reach $23 trillion by 2020. In FY2015, the US Treasury collected $3.2 trillion in taxes and other revenues, but spent $3.7 trillion. Profligate state and local spending has swollen these deficits by tens of billions more, for the same reason: politicians are in cahoots with unions, crony capitalist rent seekers, and assorted grievance, victim and welfare groups. Mountains of federal regulations cost businesses and families $1.9 trillion annually - half of our national budget. They drag down investment, job creation and tax revenues. State and local rules add more pain. To borrow the Greens and Democrats’ favorite term, this is unsustainable. Oil, gas and coal account for 82% of all US energy and 68% of all US electricity generation - reliably and affordably. Producing this abundant energy also generates positive cash-flow: fossil fuel bonuses, rents and royalties from federal lands totaled $126 billion between 2003 and 2013; corporate and personal taxes resulting from the jobs and activities powered by that energy added tens of billions more. Wind, solar and biofuel programs, by contrast, are black holes for hard-earned taxpayer subsidies - and rarely work unless consumers are required to use that energy, and pay premium prices for doing so. Even getting to 50% “carbon-free” energy fifteen years from now will require: vastly more subsidies and mandates; turning entire forests into fuel; blanketing croplands and habitats with enormous biofuel plantations, wind farms and solar installations; and killing millions of birds, bats and other wildlife in the process. However, biomass and biofuels are also carbon-based and also release carbon dioxide and their energy per volume is paltry, their energy efficiency deplorable, compared to hydrocarbons. Environmentalists used to tell poor countries they could never have the lifestyles of people in developed nations, as it wouldn’t be sustainable. Now they say our living standards are unsustainable and aren’t fair to the world’s poor. Therefore, their lives should be improved a little via wind, solar and biofuel energy, while ours are knocked down a peg via climate and sustainability regulations (except for ruling elites). Environmentalists and other liberals are also hardwired to be incapable of acknowledging the countless health, welfare and technological blessings that creative free enterprise capitalism has bestowed on humanity or to recognize the dearth of innovation by repressive socialist regimes. Fossil fuel and fracking bans are part of that “fundamental transformation.” They will force us to use less oil and gas, but they also mean we will import more petroleum from Saudi Arabia and Iran, though not from Canada via the Keystone pipeline. Energy prices will again climb into the stratosphere, more jobs will disappear, manufacturing will shrivel, and royalty and tax revenues will evaporate. The billionaire bounties that Hillary, Bernie and their supporters also need to pay for all the free college, ObamaCare, renewable energy subsidies, income redistribution and other “entitlements” will likewise be devoured quickly, while millions more people end up on welfare and unemployment rolls. The bills will simply be forwarded to our children and grandchildren. Meanwhile, despite any US bans, other countries will continue using fossil fuels to create jobs and grow their economies. So total atmospheric CO2 and greenhouse gas concentrations will continue to rise. Of course, “climate deniers” and other members of The Resistance will have to be dealt with. Attorney General Loretta Lynch and Senator Sheldon Whitehouse will pave the way on that. In the process, as Obama and Clinton mentor Saul Alinsky put it in his Rules for Radicals, the ruling elites will pick, freeze, personalize and polarize their targets. They will repeat their allegations and maintain their pressure until all resistance crumbles. Facts will be irrelevant. Power and perceptions will rule. Blue collar, middle class and minority families feel they are fighting for their very survival, against policies and regulations that profoundly impair their jobs, incomes and futures. Indeed, the governing classes are actively harming the very people they claim to care the most about - and actually killing people in the world’s poorest nations, by denying them access to energy and other modern technologies. That’s why Trump, Cruz, Carson and other “outsider” candidates have resonates. People are fed up. Perhaps it’s time to borrow a page from Alinsky - Rule Four, to be precise - and make “the enemy,” the ruling elites, live up to their own rules. Watching them scream and squeal would be most entertaining. After a University decision to cut all its funding, Yale’s Climate & Energy Institute will close by the end of June. The loss of the institute, which for the last eight years has conducted research related to issues of climate change, leaves a hole in climate and energy studies at Yale. Although the Energy Studies academic program will continue within Yale College, students in the YCEI said they were outraged by the budget cuts and subsequent closure of an institute that is one of the only research-focused climate change programs for undergraduates on campus. The announcement came in a Monday afternoon email to the YCEI community from institute co-directors and geology and geophysics professors David Bercovici and Jay Ague, and follows years of cuts to the institute’s funding, according to students involved in the organization. The YCEI was founded in 2008 with the backing of then-University President Richard Levin. Since then, the institute has hosted conferences, fostered collaborations across science departments and between universities outside of Yale, as well as supported scholarships and postdoctoral fellowships that address the changing climate. The institute also supplied undergraduates with a database of energy-related internships. Bercovici and Ague wrote that the YCEI was founded with “overwhelming enthusiasm from faculty and students across campus.” Bercovici and Ague declined to comment Monday night, citing time constraints. Students interviewed said that while the YCEI was clearly a priority under Levin, administrative support has dwindled recently. They said they were infuriated by the announced closure and skeptical that it was closing because of insufficient funding. He added that he has received emails from YCEI alumni who were furious with the announcement, and he said there are many undergraduates who are also upset. The YCEI had an extensive budget under Levin’s administration, Goldklang said. Although Goldklang did not provide specific figures, he said the YCEI had enough money to pay its student fellows, fund research and create new classes in the Energy Studies Program. The institute was one of the few groups on campus that regularly engaged with Yale administrators to solve issues of climate change, Goldklang said. The announced closure left students in the institute with unanswered questions about why the formerly thriving group had its funding cut. University Provost Benjamin Polak - who is currently engaged in annual budget talks with every area of campus - did not respond Monday to questions about the reasons for the YCEI’s funding cuts. Salovey was also unavailable for comment Monday evening. YCEI conference organizer Jared Milfred ‘16 speculated that the YCEI may have been viewed as redundant or doing research that overlapped with other science departments on campus. The School of Forestry & Environmental Studies and the Energy Sciences Institute at West Campus conduct similar climate studies to the YCEI, although they do not engage with undergraduates to the same extent as the YCEI, Milfred said. Barile said the institute’s budget had been cut in half over the last three consecutive years. “They eventually cut funding so much that it just became buying food,” Barile said. Milfred also said he was aware of drops in the budget in the past few years, but said he had believed these cuts were in line with reductions at comparable institutes across the University. “I never realized that the YCEI was being targeted specifically,” Milfred said. Former YCEI New Haven Energy Scholar Intern Sandra Medrano ‘15 also said the news completely surprised her, adding that she had no idea what caused the institute’s demise. The budget cuts also follow a leadership transition in the YCEI administration: Current executive director and geology and geophysics research scientist Michael Oristaglio ‘74 took over the position from Mark Pagani, his colleague in the department, last summer. The YCEI’s closure leaves behind a hole for students who are interested in climate change issues academically, but are not interested in activist causes like Fossil Free Yale, Goldklang said. Before the institute closes, the YCEI faculty advisory committee will help students in the senior class finish their requirements for the program, Oristaglio said in a Monday email to YCEI undergraduates. The Energy Studies Program may fill some of the space left by the YCEI, and students will have a chance to think of ways that Energy Studies can evolve at a series of dinners through the rest of the semester, Oristaglio wrote. The first such dinner took place last week, and students generated ideas about how to bolster the Energy Studies curriculum and strengthen the sense of community between students in the program. There are a number of University climate change initiatives that were instituted more recently than the YCEI. In December 2015, Yale became the first American university to establish a system of “carbon charges” on some of its buildings. The Yale School of Forestry & Environmental Studies was founded in 1900. Just three months earlier DiCaprio told the UN delegates that “if we do not act together, we will surely perish,” he had flown to South America on a private plane, to cruise around Brazil on the yacht of an Abu Dhabi oil billionaire. But Good Morning America didn’t mention this at all. Variety praised actor Ian Somerhalder (Boone Carlyle from Lost) for his eco-foundation’s “laser-focused on environmental issues,” while he spent his time flying to exotic countries and his foundation only gave away one-thousandth of the money it got in donations. This doesn’t stop him for blaming average people for global warming. The 12 celebrities chosen to highlight in this report are: Leonardo DiCaprio, Woody Harrelson, Julia Roberts, James Cameron, Al Gore, Arianna Huffington, Ian Somerhalder, Gwyneth Paltrow, Mark Ruffalo, Matt Damon, Cameron Diaz and John Travolta. The media have used all of these celebrities to help promote their own climate alarmist agenda, while simply ignoring or glossing over any inconsistencies or contradictions. This report doesn’t focus on every single celebrity hypocrite. Instead, it looks at 12 whose lifestyles contradict their activism. During the past six months of 2014 alone, ABC, CBS and NBC interviewed the celebrities highlighted in this report 25 times. Not once during any of these interviews did the networks suggest that the celebrities’ lavish lifestyles might disqualify them from lecturing others. Instead, they have referred to them as “incredibly committed,” “responsible” and praised them for “promoting the cause” of combatting climate change. (1) Media Outlets Give a Platform to Celebrities: Actors aren’t climate scientists. But when any of the 12 celebrities makes a statement about climate change, the media are quick to promote them. Whether it was DiCaprio’s UN speech calling for more regulations on businesses, or Cameron Diaz’s PSA asking average people to curb their carbon output, print and broadcast media eagerly rushed to interview them. In the last six months of 2014 alone, ABC, CBS and NBC interviewed these specific celebrities 25 times. (2) Overwhelmingly Positive Network Coverage: Not once during the 25 interviews on ABC, CBS and NBC in 2014 did the networks suggest that the celebrities’ lavish lifestyles might disqualify them from lecturing others. Instead, they have referred to them as “incredibly committed,” “responsible” and praised them for “promoting the cause” of combating climate change. (3) Media Take Outrageous Claims Seriously: Cameron said “I believe in ecoterrorism,” and Entertainment Weekly didn’t bat an eye. Arianna Huffington said that SUV owners were funding terrorism, and then claimed she meant it as satire and no one objected. Yet, none of these claims were even mentioned on the broadcast networks that hyped the eco-activism of these celebrities, and they were still touted as credible voices for change. (1) Treat Celebrities Honestly: Celebrities may be famous, but that doesn’t mean that they should automatically get a platform to promote their eco-agenda. Journalists need to recognize that just because someone is well known, doesn’t mean they are well informed. Statements made by celebrities should be evaluated with the same scrutiny as statements given by anyone else. (2) Don’t Pick and Choose the News: The Society of Professional Journalists Code of Ethics states that journalists should “support the open exchange of views, even views they find repugnant.” It is incumbent upon journalists to analyze the background for groups and individuals on both ends of the political spectrum. (3) Do Some Genuine Journalism and Investigate Celebrity Climate Change Alarmists: Journalists can’t afford to be starstruck. Media outlets should hold celebrities accountable for their actions, and not turn a blind eye when a celebrity’s lifestyle contradicts his or her message. The U.S. Supreme Court just delivered a major blow to President Barack Obama’s global warming agenda by halting the implementation of a key Environmental Protection Agency (EPA) regulation on carbon dioxide emissions. The court won’t allow the EPA to implement its so-called Clean Power Plan (CPP), which aims to reduce carbon dioxide emissions from power plants 32 percent by 2030. This is a big win for the 29 states suing the federal government to stop a rule expected to cripple the coal industry. “Five justices of the Supreme Court agreed with North Dakota and other parties that EPA’s regulation would impose massive irreparable harms on North Dakota and the rest of the country and that there was a substantial likelihood EPA was acting unlawfully,” Paul Seby, an attorney with law firm Greenberg Traurig representing the state of North Dakota, told The Daily Caller News Foundation. States asked the Supreme Court to halt implementation of the CPP after a lower court rejected their appeal in January. Now, Morrisey and the Obama administration will make their oral arguments on the merits of the law in front of federal judges in June. “Make no mistake - this is a great victory for West Virginia,” said West Virginia Attorney General Patrick Morrisey, who’s leading the states against the EPA, in a statement on the announcement. Morrisey argues the CPP amounts to “double regulating” by the EPA, since coal-fired power plants - the main target of the rule - are already being regulated under another provision of the Clean Air Act. States also argue the CPP is in effect a federal takeover of their energy policies. “We are thrilled that the Supreme Court realized the rule’s immediate impact and froze its implementation, protecting workers and saving countless dollars as our fight against its legality continues,” Morrisey said. This is the second major EPA regulation to be held up by the courts in recent months. Last year, federal judges issued a stay on an agency rule redefining “waters of the United States” - this sparked backlash from nearly every industry from farmers to energy producers. But defeating the CPP in court may not be as easy as states think, since the Obama administration will likely argue striking down these rules would go against international commitments made by the U.S. in Paris last year. In December, the U.S. joined nearly 200 countries in pledging to reduce carbon dioxide emissions to fight global warming. Obama promised to cut emissions 26 to 28 percent by 2025. The Obama administration, however, may have problems of its own because it has not gotten the agreement ratified by the Senate - a key requirement for a legally binding treaty. This has only added to the confusion of whether or not the United Nations Paris deal is legally a treaty or not. “This will be a fatal blow to the president’s climate agenda,” Tom Pyle, president of the Institute for Energy Research, told TheDCNF. “This shows just how far the Obama administration has gone - they went too far,” Pyle said. A Quinnipiac University poll, taken June 24-30, 2014 ranking worst presidents since WWII found Obama the worst and Bush 41 second. January 22nd, 2016 by Roy W. Spencer, Ph. D.
We now have the official NOAA-NASA report that 2015 was the warmest year by far in the surface thermometer record. John and I predicted this would be the case fully 7 months ago, when we called 2015 as the winner. In contrast, our satellite analysis has 2015 only third warmest which has also been widely reported for weeks now. I understand that the RSS satellite analysis has it 4th warmest. And yet I have had many e-mail requests to address the new reports of warmest year on record. I’ve been reluctant to because, well, this is all old news. (Also, my blog has been under almost constant “brute force login attacks” for the last month, from a variety of IP addresses, making posting nearly impossible most days). - Land measurements ...that thermometers over land appear to have serious spurious warming issues from urbanization effects. Anthony Watts is to be credited for spearheading the effort to demonstrate this over the U.S. where recent warming has been exaggerated by about 60%, and I suspect the problem in other regions of the global will be at least as bad. Apparently, the NOAA homogenization procedure forces good data to match bad data. That the raw data has serious spurious warming effects is easy to demonstrate...and has been for the last 50 years in the peer-reviewed literature...why is it not yet explicitly estimated and removed? - El Nino ----that a goodly portion of the record warmth in 2015 was naturally induced, just as it was in previous record warm years. - Thermometers Still Disagree with Models ...that even if 2015 is the warmest on record, and NOAA has exactly the right answer, it is still well below the average forecast of the IPCC’s climate models, and something very close to that average forms the basis for global warming policy. In other words, even if every successive year is a new record, it matters quite a lot just how much warming we are talking about. Then we have scientists out there claiming silly things, like the satellites measure temperatures at atmospheric altitudes where people don’t live anyway, so we should ignore them. Oh, really? Would those same scientists also claim we should ignore the ocean heat content measurements - also where nobody lives - even though that is supposedly the most important piece of evidence that heat is accumulating in the climate system? Finally, I don’t see why any of this matters anyway. Didn’t the Paris agreement in December signify that world governments are going to fix the global warming problem? Or was that message oversold, too? I’m not claiming our satellite dataset is necessarily the best global temperature dataset in terms of trends, even though I currently suspect it is closer to being accurate than the surface record - that will be for history to decide. The divergence in surface and satellite trends remains a mystery, and cannot (in my opinion) continue indefinitely if both happen to be largely correct. But since the satellites generally agree with (1) radiosondes and (2) most global reanalysis datasets (which use all observations radiosondes, surface temperatures, commercial aircraft, satellites, etc. everything except the kitchen sink), I think the fact that NOAA-NASA essentially ignores it reveals an institutional bias that the public who pays the bills is becoming increasingly aware of. By now it has become a truism that government agencies will prefer whichever dataset supports the governments desired policies. You might think that government agencies are only out to report the truth, but if that’s the case, why are these agencies run by political appointees? I can say this as a former government employee who used to help NASA sell its programs to congress: We weren’t funded to investigate non-problems, and if global warming were ever to become a non-problem, funding would go away. 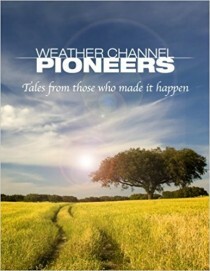 I was told what I could and couldn’t say to Congress...Jim Hansen got to say whatever he wanted. I grew tired of it, and resigned. Let me be clear: I’m not saying climate change is a non-problem; only that government programs that fund almost 100% of the research into climate change cannot be viewed as unbiased. Agencies can only maintain (or, preferable, grow) their budgets if the problem they want to study persists. Since at least the 1980s, an institutional bias exists which has encouraged the climate research community to view virtually all climate change as human-caused. There indeed is a climate change problem to study...but I don’t think we know with any certainty how much is natural versus manmade. There is no way to know, because there is (contrary to the IPCC’s claims) no fingerprint of human versus natural warming. Even natural warming originating over the ocean will cause faster warming over land than over ocean, just as we already observe. But since the government has framed virtually all of the research programs in terms of human-caused climate change, that’s what the funded scientists will dutifully report it to be, in terms of supposed causation. And until the culture in the government funding agencies changes, I don’t see a new way of doing business materializing. It might require congress to direct the funding agencies to spend at least a small portion of their budgets to look for evidence of natural causes of climate change. Because scientists, I have learned, will tend to find whatever they are paid to find in terms of causation...which is sometimes very difficult to pin down in science. From CFACT’s perspective, EPA’s Clean Power Plan is not warranted by the Clean Air Act or evidence relied upon by the Agency. The plan will harm human health and welfare, but do nothing to improve environmental quality or prevent climate change, much less “dangerous” climate change. Indeed, EPA’s rules themselves present a far more serious threat to the health, welfare and pursuit of happiness, justice and civil rights progress of our members, the people we represent, and all Americans - than do any reasonably foreseeable manmade climate and weather changes. Our detailed analysis follows. Those rising electricity rates will affect everything people make, grow, ship, eat and do - just as they have in Europe. They will impair people’s livelihoods, living standards and life spans. More elderly people will be put at risk from hypothermia, because they can no longer afford to heat their homes properly. Contrary to EPA statements regarding the dangers of global warming, cold weather kills 20 times more people than hot weather - and recent winters have been long and cold in much of the United States, Europe and elsewhere. In Britain, thousands of pensioners now die of hypothermia every winter, because soaring energy costs have made it impossible for them to afford adequate heat. To cause that to happen here in the USA would be immoral and unconscionable. Instead of acknowledging any of this, EPA has employed a deceptive “social cost of carbon” analysis that places arbitrary inflated costs on damages the agency claims result from alleged climate risks from using carbon-based fuels. These calculations include every imaginable and imaginary cost of using fossil fuels while completely ignoring the enormous benefits of utilizing coal, oil and natural gas. To get this result, the NOAA study adjusted sea-surface temperature data from a global network of buoys upward by 0.12 degrees Celsius (0.25 F), to “homogenize” the buoy data with records from engine intake systems on ships - and thereby create a previously undetected warming trend. (That alleged warming trend was a bare few hundredths of a degree, less than the margin of error in NOAA’s review.) However, the intake data were contaminated by heat from the ships, rendering them invalid, whereas the buoy network was designed for accurate environmental monitoring. No one should be victimized by misleading claims by private companies or made by government agencies or scientists or third-party scientists whom they hire and use to validate policies and regulations. Equally important, no one forces us to buy a VW or any other car. But when it comes to laws and regulations, we have no choice. We must submit to them, or else. If those rules are based on dishonesty - on emission deception on a large, unprecedented level in the case of climate rules - we pay a huge, unacceptable price. That is exactly what is happening under EPA’s Clean Power Plan. Germany’s reliance on coal continues to rise; it now generates 44 percent of its electricity from the black rock ‘ more than any other EU nation. In Poland, Prime Minister Eva Kopacz says nuclear energy is no longer a priority, and her country’s energy security will instead focus increasingly on coal. Pakistan is taking a similar path as are Vietnam, the Philippines and other Southeast Asian nations. Even Japan plans to build 41 new coal-fired units over the next decade, partly to replace its nuclear power plants. Overall, says the International Energy Agency, Southeast Asia’s energy demand will soar 80 percent by 2040, and fossil fuels will provide 80 percent of the region’s total energy mix by that date. Africa will pursue a similar route to lifting its people out of poverty. The continent has abundant oil, coal and natural gas and it intends to burn those fuels, while it utilizes wind and solar power in remote areas until they can be connected to the continent’s slowly growing electrical grids. How much is Earth warming, if at all? How much of actual warming and other climate changes in recent decades are due to mankind’s use of fossil fuels and emission of greenhouse gases and how much are due to powerful solar and other natural forces over which humans have absolutely no control? And will any changes be short-term or long-term///good, bad, neutral or catastrophic? At this time, there is no scientific evidence based on actual observations and measurements of temperatures and weather events that humans are altering the climate to a significant or dangerous degree. Computer models, political statements and hypothetical cataclysms cannot and must not substitute for that absence of actual evidence, especially when the consequences would be so dire for so many. Simply put, the danger is not climate change which will always be with us. The real, immediate danger is energy restrictions imposed in the name of controlling Earth’s perpetually fickle climate. I am pasting below a copy of an email that I’ve sent to many members of the National Academy of Sciences. I’ve also sent a version of it to the board members of the AAAS. And I have posted it to the National Association of Scholars website here. It explains itself pretty clearly, but it will help to give a little background. We were drawn into this by James Enstrom, a former UCLA senior scientist and a National Association of Scholars member. We championed his case when he was fired for blowing the whistle on a major fraud at the California Air Resources Board (CARB). CARB had issued research findings (and ultimately regulations) based on a study that Enstrom demonstrated was fraudulent. The main author of the study had a mail order Ph.D. - as it happens, the address of the phony degree-granting institution is on Madison Avenue two blocks from my office. There was other mischief too, involving several of Enstrom’s colleagues who had seats at CARB. Enstrom sought to publish some account of this in Science under the editorship of Marcia McNutt. He didn’t get anywhere. But he did end up making the acquaintance of other scientists who had similar experiences with McNutt. McNutt is now the only candidate to be president of the National Academy of Sciences. Enstrom hoped that if he could draw attention to her record of bolting the door against scientific dissent from establishment positions, the members of the Academy might have second thoughts. I don’t want to put the National Association of Scholars into a campaign against McNutt’s election, but it does seem to me a good opportunity to raise broader questions about how science is now conducted in the United States - and how public policy is being built on it. For several years I’ve been trying to get some traction for the National Association of Scholars on the threats to the integrity of contemporary science arising from entrenched political interests. We.ve made relatively little headway with this, although our studies of the sustainability movement and its subsidiary the fossil fuel divestment movement have attracted considerable attention. There are, of course, a handful of people in Congress who have enunciated their skepticism about the global warming orthodoxy and now the reliability of the Marks paper that claims that the pause in global warming never happened. Breaking through the barriers to open scientific discussion requires finding 1) champions who can command public attention and respect; 2) factual narratives that are relatively easy for the public to grasp; and 3) vulnerabilities that the establishment cannot trivialize. I would think the best way to deal with the three issues mentioned in my letter would be to get the press interested in the enormous costs of the regulations that have been based on these spurious - or at least dubious - theories. This is an NAS to NAS letter - which requires some “disambiguation.” I am president of the National Association of Scholars, founded in 1987, and whose organizers apparently didn’t give much thought to the space already occupied by those initials by the National Academy of Sciences, founded 124 years earlier. I’ll defer to the Academy’s seniority by reserving NAS in what follows for the body of scientists who incorporated during President Lincoln’s tenure. The National Association of Scholars is a broad-based group of academics that includes professors in the humanities and social sciences (I’m an anthropologist) as well as the natural sciences. Earlier this year, nine accomplished scientists and academics submitted to Science well-documented evidence of misconduct by several of the PM2.5 researchers relied upon by EPA. The evidence of misconduct was first submitted to Dr. McNutt in a detailed June 4, 2015 email letter, then in a detailed July 20, 2015 Policy Forum manuscript “Transparent Science is Necessary for EPA Regulations,” and finally in an August 17, 2015 Perspective manuscript “Particulate Matter Does Not Cause Premature Deaths.” Dr. McNutt and two Science editors immediately rejected the letter and the manuscripts and never conducted any internal or external review of the evidence. This a consequential matter because many multi-billion dollar EPA air pollution regulations, such as, the Clean Power Plan, are primarily justified by the claim that PM2.5 is killing Americans. The relevant documents regarding this controversy can be examined here. Dr. McNutt’s position is, of course, consistent with the official position of the AAAS. But the attempt to declare that the “pause” in global warming was an illusion has not been accepted by several respected and well-informed scientists. One would not know this, however, from reading Science, which has declined to publish any dissenting views. One can be a strong supporter of the consensus model and yet be disturbed by the role which Science has played in this controversy. Dr. McNutt and the journal have acted more like partisan activists than like responsible stewards of scientific standards confronted with contentious claims and ambiguous evidence. The relevant documents and commentary regarding the Karl paper and McNutt editorials can be examined here. I welcome your responses. The National Association of Scholars will present an open forum on these matters with a section reserved specifically for NAS members. Furthermore, I will put you in contact with NAS members who are concerned about Dr. McNutt becoming the next NAS president. 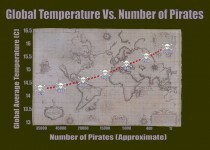 You can see that as the number of pirates in the world has decreased over the past 130 years, global warming has gotten steadily worse. 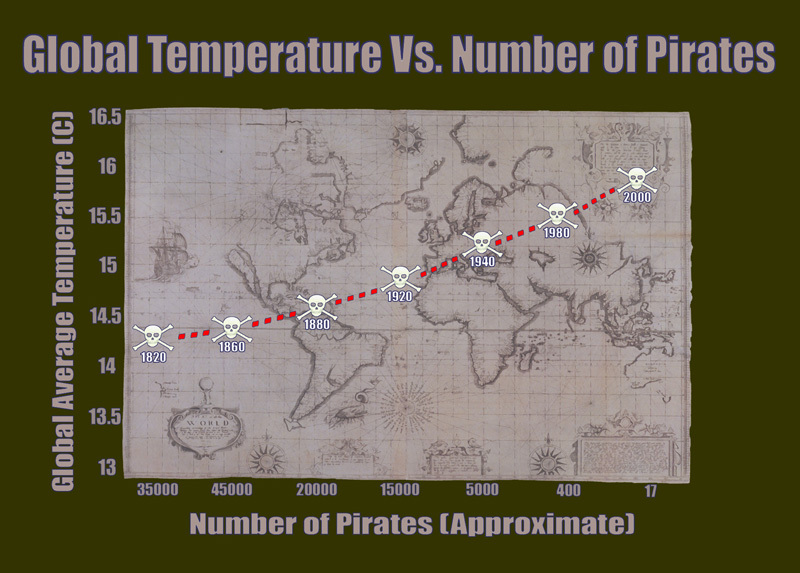 In fact, this makes it entirely clear that if you truly want to stop global warming, the most impactful thing to do is - become a pirate. Someone who has cancer drinks gallons of lemon water and their cancer goes into remission: they create a website to talk about how lemon water cures cancer. A business is doing badly and they move to a new building and things start to pick up: the CEO writes a book about how changing your environment is the key to success. Statistics show that people who leave their jobs after less than a year are more likely to smoke: someone starts a campaign to reduce smoking by encouraging people to stay at their jobs longer. My older sister, a very wise and smart woman who is a political scientist at Syracuse University, teaches a statistics class to freshmen, where she endeavors to teach them critical thinking. She talks about this as being the most common error in logic: confusing simultaneity with causality. In other words, assuming that because two things are happening at the same time, they exist in a cause and effect relationship with each other. Because anyone can say anything anywhere these days (pretty much), there’s a lot of fuzzy thinking floating around that seems more legitimate than it would have in former times because it’s in print. Now, don’t get me wrong: I’m a huge proponent of free speech. I just feel we all have to be more discriminating than ever before about what we believe. Not cynical or negative: discriminating. So, when someone proposes a cause and effect relationship between two things - reduction in pirates causing global warming; Obama creating the global economic crisis; young people ruining American business - ask for the data that shows they’re related, rather than simply that they’re happening at the same time. But if you’re dead set on becoming a pirate, I’m not going to stop you.